...but how do you access your vast knowledge base? IdeaFlow® is an enterprise crowdsourcing software solution that puts all of the resources of your company at your fingertips with an on-demand, human-powered knowledge management platform that is both scalable and secure. When you need a solution to a problem, or have a question that needs to be answered quickly and confidentially, your very own people may be your best asset. Regardless of the size of your organization, someone in your company may already have a solution to your problem, or can give you valuable insight to help you get the answers you need. Your organization is full of experienced, resourceful people who understand your market, your technologies, and your clients. By using the right tool, these people can be motivated to dramatically increase the innovation capabilities of your company. The solutions to your challenges could be closer than you think. How can you access this valuable resource in an efficient and effective way? IdeaFlow® is an enterprise crowdsourcing solution that puts all of the resources of your company at your fingertips with an on-demand, human-powered knowledge management platform that is both scalable and secure. The platform can be used for idea gathering, finding solutions to complex technical problems, finding information about suppliers and materials, getting scientific insight, and getting answers to tough questions. Questions and problems are posted in a challenge-based framework, and participants on the platform are incentivized to collaborate and find solutions to the company's challenges. Abraham Lincoln once said "Give me six hours to chop down a tree and I will spend the first four sharpening my axe." You need put effort into making sure that you are asking the right question if you want to get a solution that is actionable. This stage of the platform provides a structured format for a group of stakeholders to brainstorm and investigate root causes of the problem and develop questions to be answered. These questions are evaluated and ranked by the group, and the best ones are refined and turned into challenges. In this stage, each challenge is published on your secure platform, and disseminated to people in your company who wish to participate — it could be a select group of scientists, or it could be thousands of diverse people. Participants then collaborate to develop a solution. The best contributions are awarded with small cash prizes, gift certificates and/or accolades such as letters of appreciation from your head of R&D. Administrators have full access to metrics, user management and process management. IdeaFlow® allows you to keep sensitive information and challenges inside the company, but you can easily expand your search for answers to IdeaConnection's industry-leading, confidential external platform when required. Tap into our pool of experienced challenge writers to help your challenges effectively communicate the problem and attract the best ideas from the right people. Not sure what challenges to launch? 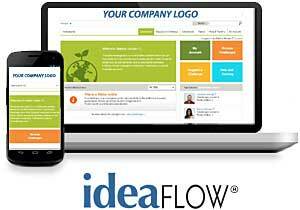 IdeaFlow™ harnesses the power of crowdsourcing for challenge topic generation. Topic creators can invite select users to collaborate and refine topic areas via a unique idea board. An evaluation team can then discuss and vote on the best challenge ideas, resulting in higher quality challenges before they are presented to the community. IdeaFlow® is an interactive system that gives the community the power to drive the best ideas to the table and gives you the power to set specific incentives for solutions. By recognizing and rewarding solvers for their contributions, they will be more likely to use your open innovation portal over other venues. Understanding challenge dynamics is important for your open innovation platform to succeed. From challenge suggestions to challenge success stories, IdeaFlow® has the management tools in place to effectively build, launch, track, and measure the performance of your innovation challenges with real time statistics. Providing a knowledge base that is catered to the needs of your users will help them to be more productive and reduce the impact on your internal support resources. IdeaFlow™ allows you to create a custom help and training section for easy access to your training materials and answers to their frequently asked questions.